Need advice for the Best Lodi Wineries, and Best Lodi Restaurants? We’re not going anywhere near the “Best Lodi Zinfandel” argument, but Lodi is actually a wonderful place for wine tasting, all around. 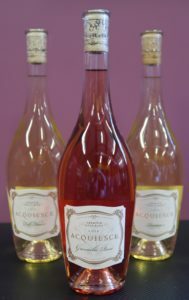 We’re not just talking about Zinfandel: Lodi also produces many impressive white wines. 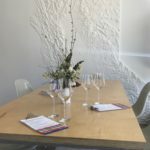 On some recent Lodi wine tasting trips we discovered outstanding Albariño, Chenin Blanc, Gewürztraminer, Grenache Blanc, Moscato, Picpoul Blanc, Roussanne, Symphony, Verdejo, Verdelho, and Vermentino. On the red wine side, our Lodi wine tasting efforts revealed tasty Cabernet Sauvignon, Carignane, Cinsault, Grenache, Graciano, Nero d’Avola, Petit Verdot, Tempranillo, and Touriga wines. In addition to great wines, Lodi also has plenty of food destinations for a variety of moods. If you’re looking for fast and easy, the first frosty mug of A&W Root Beer was served here in Lodi in 1919 and the restaurant on Lodi Avenue is still serving up Papa Burgers, Fries and Root Beer Floats. If a relaxing Brunch on an outdoor patio is more your speed, the Towne House Restaurant features premium wines, specialty cocktails, and dishes such as Banana Stuffed French Toast, Loco Moco or a Smoked Salmon Scramble. Below you will also find information on the best Lodi Scones, Salads and Sandwiches we have found. The Lodi Wine and Visitors Center (2545 West Turner Road, Lodi, 209-365-0621) is open from 10 am to 5 pm daily and can offer additional assistance with the area and its 90 wineries (with about 110,000 acres of vineyards). The Center has an expansive tasting bar featuring regional wines, a demonstration vineyard which can provide education about grape growing and a gift shop featuring handcrafted products and Lodi giftware. 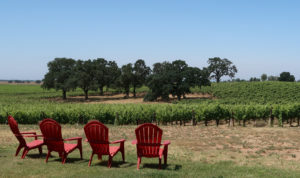 They can also share what they consider the best Lodi wineries. We’ve had a lot of great food in Lodi, and the best Lodi restaurants (for us, so far) are below. Corner Scone Bakery – A Mother/Daughter team, Terrie Green and Tara Miller, are making delicious scones, muffins, pies, and other treats in a cute and cozy bakery. Menu items have included Cinnamon Rolls, Morning Glory Muffins, Blueberry Bran Muffins, Bacon Egg and Cheddar Breakfast Sandwich, Buttermilk Spice Coffee Cake, Southwestern Quiche and Quiche Lorraine. Their popular Scones include Chocolate Chip, Lemon Poppyseed, Mixed Berry, and there’s even a Maple Bacon version. If you’re interested, Corner Scone also offers a “High Tea” experience on Saturdays at their nearby The Hidden Tea Room. 322 North California Street, (209) 747-3418 – closed on Sundays and Mondays so plan accordingly. Fiori’s Butcher Shoppe and Deli – Joe and Barbara Fiori founded this place in 1983 so they’ve been serving the community for over 30 years. Back then, Joe cured his own pastrami and corned beef, smoked salmon and home-made bratwurst, and that tradition continues. The extensive sandwich menu here is rounded out with soups and chili, fresh salads and a daily changing selection of quiches. You can also place your order in advance for either inside pick-up or curbside pick-up (just remember they’re closed Sundays and Mondays). 400 West Lodi Avenue, Lodi (209) 334-4121 for inside pickup, (209) 334-0333 for curbside. If you’re planning a Lodi wine tasting trip and need advice on Lodging, we suggest you reach out to the Downtown Lodi Visitor Center (800-798-1810) or explore their website for ideas. They can help you with Hotels, Motels, Bed and Breakfasts, RV and Campground spots, and/or Vacation Homes.